We come to earthly existence at various stages of spiritual development/progression. One must live his/her own life, and each one of us must go his/her own way, guided by Ma-at. The concept of Ma-at has permeated all Egyptian writings from the earliest times and throughout Egyptian history. It’s the concept by which not only men but also the neteru (gods, goddesses) themselves were governed. Ma-at is not easily translated or defined by one word. 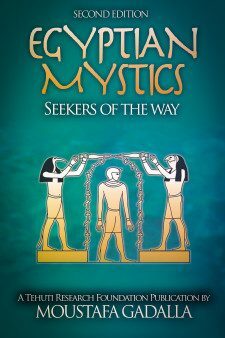 Basically, we might say that it means that which, of right, should be – that which is according to the proper order and harmony of the cosmos and of neteru and men, who are part of it. Ma-at could be favorably compared with the Eastern concept of karma and the Western concept of common sense. Ancient Egyptian wisdom has always laid great emphasis on the cultivation of ethical behavior and service to society. The constant theme of the Egyptian wisdom literature was the ‘acting out’ of Truth—Maa Kheru—on Earth. Ma-at represents the truth; the Way. She is always depicted wearing the feather of truth on her head. Likewise, the Sufis speak of the Path/Way, and seeking the truth. In Ancient Egypt, the concept of Ma-at has permeated all Egyptian writings, from the earliest times and throughout Egyptian history. Ma-at, The Way, encompasses the virtues, goals, and duties that define acceptable (if not ideal) social interaction and personal behavior. Ma-at is maintained in the world by the correct actions and personal piety of its adherents. A summary of the Egyptian concept of righteousness can be found in what is popularly known as the Negative Confessions [as discussed later, in the next chapter]. A more detailed picture of a righteous man and the expected conduct and the ideas of responsibility and retribution can be obtained from the walls of tomb chapels and in several literary compositions that are usually termed as wisdom texts of systematic instructions, composed of maxims and precepts. Among them are the 30 chapters of the Teaching of Amenemope (Amenhotep III), which contain many wisdom texts that were later adopted in the Old Testament’s Book of Proverbs. Give your ears, listen to the words that are spoken, give your mind to interpreting them. It is profitable to put them in your heart. There were additional practical wisdom texts of systematic instructions composed of maxims and precepts that highlighted the Do’s and Don’ts. One learns to both negate (refrain) vices and affirm (cultivate) virtues. The Egyptian teachings emphasize that individuals must be active participants in the society, and to apply what they learn by serving others. The individual’s performance in the society is the true test of his/her success. All individuals must have productive work to support themselves and their dependents. There is no retirement from the world; i.e., no monks or hermits. The Egyptian model emphasizes a balance between living in the world and seeking spiritual experiences.